Plum lips is the new trend that I enjoyed last fall and will continue it throughout the summer. It is definitely a trend that I like. I’ve always played with the lighter version of this trend, which is a berry shade which i feel works well with my skin tone and is a better alternative to those who wish to try this trend but aren’t as ready to go the whole way. You can also try this in steps by either trying a light plum gloss, or by using your finger to take some plum lipstick and “stain” your lips for a less dramatic touch and build the color up to match your comfort level. My favorite plum/ violet lipstick is the Revlon in shade “violet frenzy 027″(image to the left) . 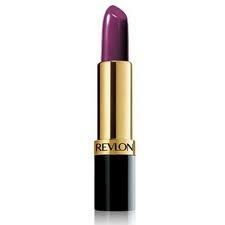 If you want to try this out I would highly recommend this Revlon lipstick. It was made in such a way that it glides on smooth and allows you to control the intensity of the color. One pass of this lipstick gives you a subtle tint but as you continue to apply is when the coloring of the product deepens to its true plum form. Give it a try! You’ll thank me later !